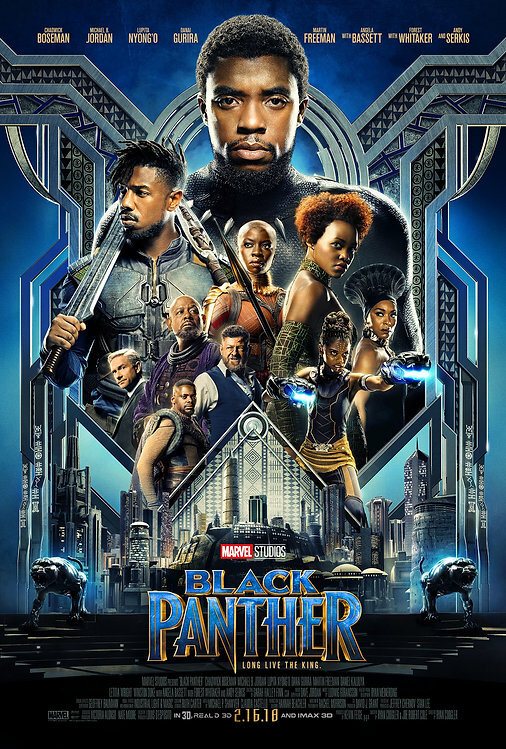 Black Panther was indeed one of the best Marvel movies to date, and not simply due to it’s beautiful setting and design, but to the knowledge it spread about the internal conflicts of the Black Community. A film that dives into the fictional world of Wakanda, fans finally got the chance to see the most technologically advanced nation in the world. A treasure kept secret for many centuries, Wakanda holds ownership to the most valuable and most powerful metal in the world, Vibranium. For those of you who are unfamiliar with what vibranium is….it’s the same metal that powers Captain America’s shield, and the same metal to which Klaue, one of Black Panther’s biggest enemies, seeks to capture. However, what I want to talk about is the battles that Black Panther(Chadwick Boseman) have to go through to ensure his nation does not become another colonized country. It’s about to get real on this review. The battle with Klaue, brilliantly played by Andy Serkis, is just a minute issue to the big picture of this film, and let me explain why. Killmonger needed him as an advantage to get ahead in the film. For those of you who missed it, they have been trying to capture Klaue since T’Challa’s father was king. When King T’Chaka(John Kani) learned that his brother, N’Joku(Sterling K. Brown), was working with Klaue and not against him, the world of Wakanda got a bit more complicated. The African-American and African diaspora have long battled with each other and this film shows the radical and peaceful side of a mind that has been conquered and a mind that still knows they are the conquerors. If there is anything that needs to be taken away from this film, it is simply that Killmonger, in all his raw anger, has a point. However, Black and Brown moviegoers in any colonized country will learn to sympathize with him, knowing that while the movie is a fictionalized representation of our issues, it is simply a reality of feelings we possess. It will leave a lot of questions to be answered about the Black community. Where do we go from here, and how does one recognize their relationship to the ones across the atlantic that we were taken away from so long ago? Not to spoil the rest of the movie, but the design of the film and the way to which Black women play the chiefs in the revitalization of both the Wakandan nation and the nation to which will be blessed with their technology(I’m not spoiling this), will be a site to see. Black women are the smarts, the beauty, and the catalysts of change that support, but also lead the nation to it’s success. The women are separated from the men by a long run and the talented Letitia Wright(Shuri), Lupita N’yongo(Nakia), and Danai Guirira(Okoye) are legendary in their battles. I can’t even describe the emotions that come with watching these women be decision makers for the king. In each way they play a crucial role to why Wakanda remains the leader of nations in the cinematic universe, whether it be through the King’s guard, a spy, or the genius behind their technological advancements. Being Black and a Woman does not stop anybody in this nation, and will assuredly bring that same feeling for young Black and Brown women as they leave the theater. Lastly, the editing, fashion, and CGI of this film are far reaching, and completely game changing in the way in which we think about society. A society that has been closed off and privileged enough to have resources that are unthinkable for any man, is possibly a world by which is fantastical. Yet, it’s so realistic that people forget that it’s a whole other world that we know nothing about. However, the fashion seems to be something that is strikingly poignant to the world of Afro-futurism. I can only hope the world in which we live in, catches on to this drift, because if I could walk around all day in the attire they had on, I definitely would. The music was perfect, sometimes too conflicting in style, yet it fit the narrative of the films’ grandiose movement of the king and the culture to which Killmonger is so familiar with. A film that brings two different worlds together for one diaspora, and a film that will assuredly bring forth a new generation of Black and Brown kids empowered to deepen their studies through the vast avenues the film dives into. Bravo to the cast and crew of this film. This is assuredly another classic.